Real heroes are those that clean up after the Super Heroes have finished saving the day. 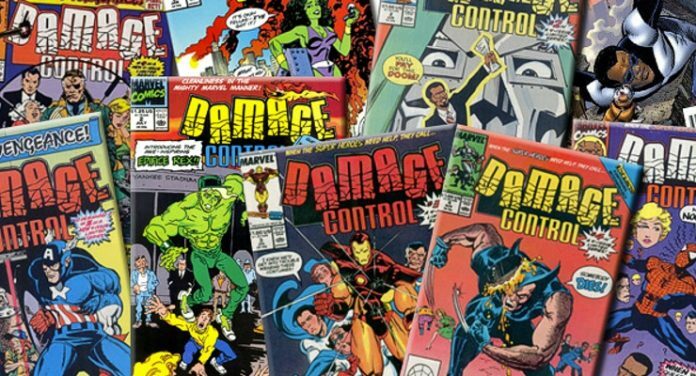 Marvel Television is producing with ABC Studios, a half-hour live-action comedy show, Damage Control. Ben Karlin (Daily Show, Colbert Report) has developed the show and is writing the script for television as well as executive producing along with David Miner (3 Arts) and Jeph Loeb , Marvel’s head of television. From the pages of Marvel Comics Presents, Damage Control is the construction company which specializes in repairing property damage caused by conflicts between superheroes and supervillains. Damage Control employees appeared only briefly in a four-page story in Marvel Age Annual in 1988. It appeared fully fleshed in 1989, when it became a serialized story and was published in the anthology comic Marvel Comics Presents #19. Damage Control follows the overworked, underpaid, clean up crew of the Marvel Universe. Specializing in dealing with the aftermath of the unique fallout from superhero conflicts, they’re the ones who are in charge of returning lost ray guns to their rightful owners, help to reschedule a wedding venue after it has been vaporized in a superhero battle, or even track down a missing prize African parrot that’s been turned to stone or goo. Damage Control joins another superhero-themed half-hour comedy project, DC’s Powerless, which has a pilot production commitment at NBC.